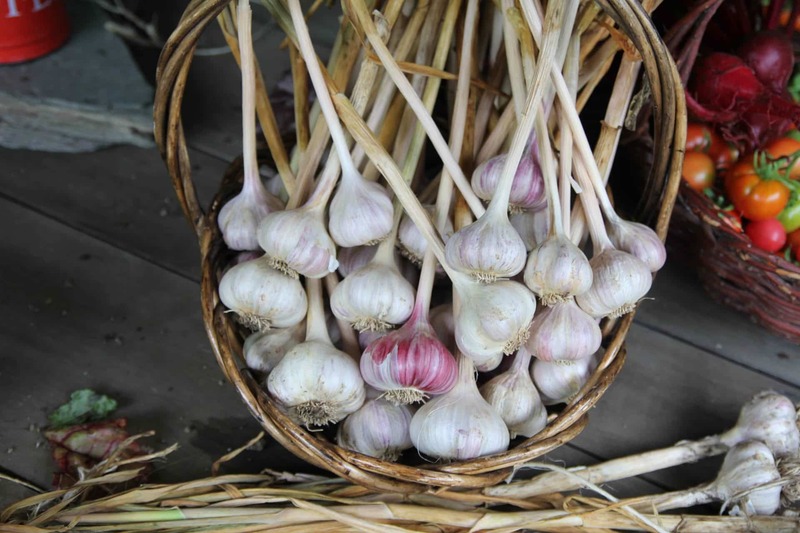 Easy to grow, popular yet pricey, garlic is a highly valued kitchen & health food staple. Why not grow your own? A forgiving and adaptable crop, it is well worth the effort! 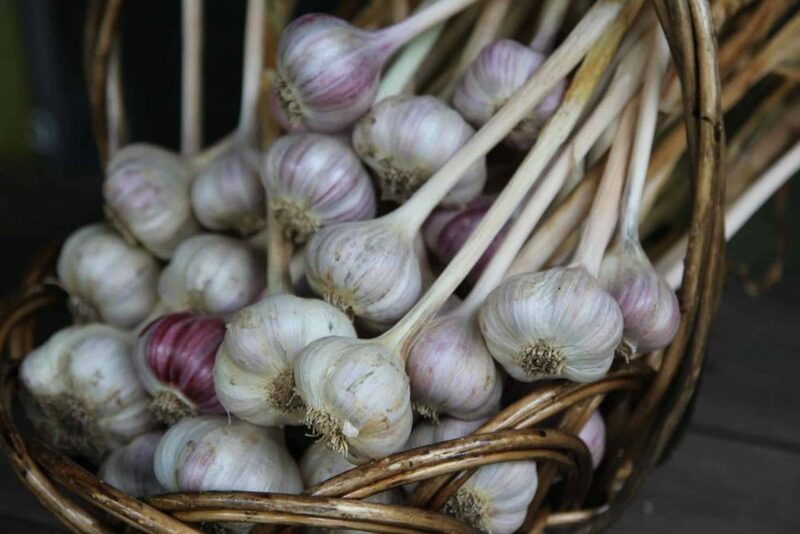 When you get into growing garlic you soon discover that there are many unique varieties to choose from, each with their own special attributes; some hotter, some milder, some streaked with purple, some extremely rare, and all special. The flavours of home grown garlic are simply amazing. If you are like me, the garlic you grew up with was the single variety available at the supermarket. Well, when you discover just how many choices there are, and taste the difference for the first time, you will soon have half a dozen varieties growing in your garden. Try a selection of varieties to determine which you like best and which grow best for you. 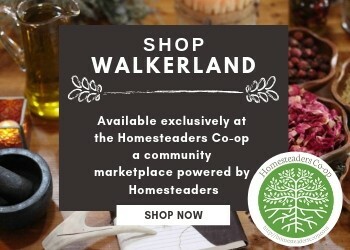 If you can’t find a local supplier you can also find organic growers that ship seed stock. This is what we have done and it has worked out well. Plant your garlic three to four weeks before the ground freezes. Here in zone 4a we plant ours mid October. You want to give the garlic a little bit of time to establish roots and get settled in before the ground hardens. Prepare the soil by mixing in plenty of organic material (compost/manure etc.) a couple weeks before planting. Garlic prefers a lighter soil to grow in so it’s especially important to add organic material to heavy soils. Break up the bulbs into individual cloves on the day of planting. Plant each cloves approximately 6 inches apart, 3-4 inches deep, with the pointy end up. A thick layer of mulch will keep the garlic insulated over the winter. 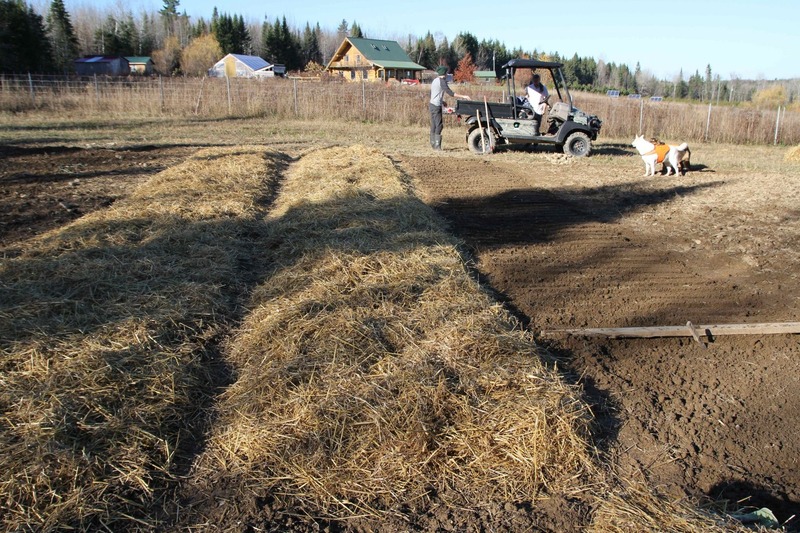 We tend to leave the straw mulch on for the entire growing season but if you have a particularity wet or cold climate you might want to remove it in the spring to allow the soil to warm and dry faster. You can reapply if suitable. The benefit of leaving the mulch in place is that over the winter as it compresses, it turns into a thick mat. This provides an excellent weed barrier. The garlic will pop right through the straw in early spring but many of the weeds around it will be suppressed. Weeds still do get through but the mulch reduces their number a remarkable amount. We don’t usually water the garlic over the summer months. 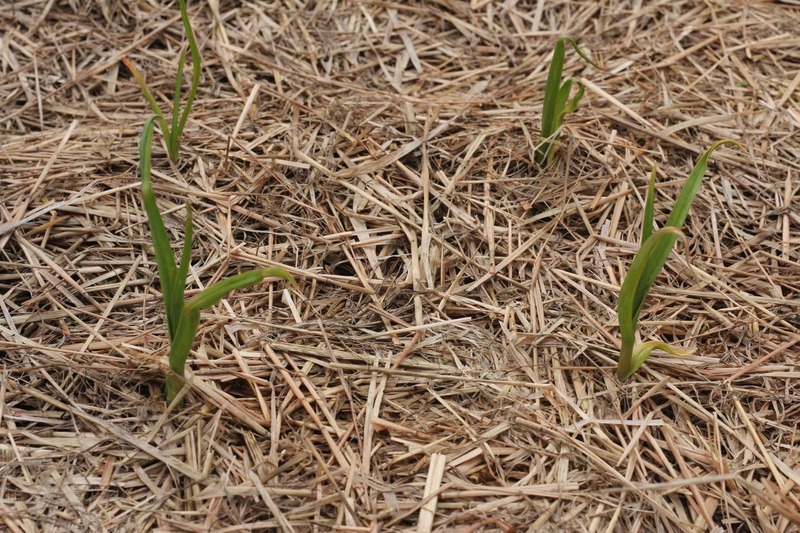 The straw mulch helps to retain moisture during any really dry months. In the spring you will notice that the garlic pops through the straw mulch and so will the occasional weed. It is important to pull up the weeds as the garlic does not compete well with them, but weed carefully. It’s important that you do not disturb the garlic. In late spring the garlic will start to grow a scape. 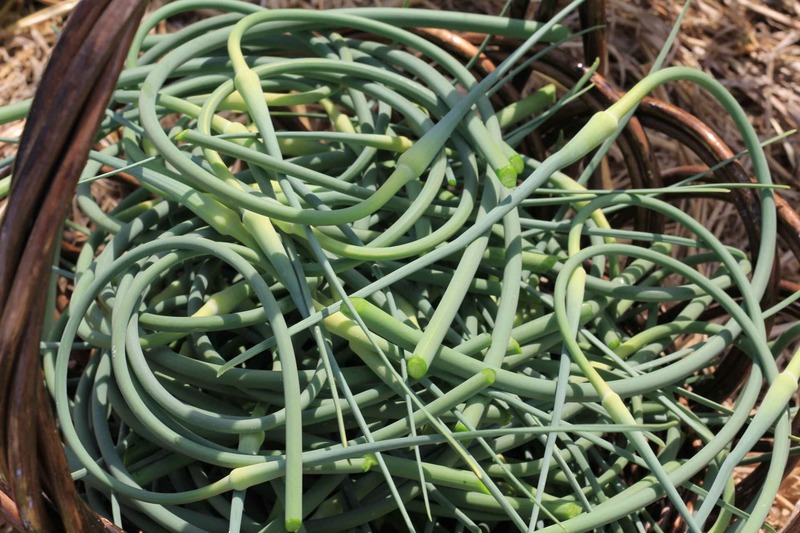 Garlic scapes are the flower stalks that shoot up from the garlic bulb. 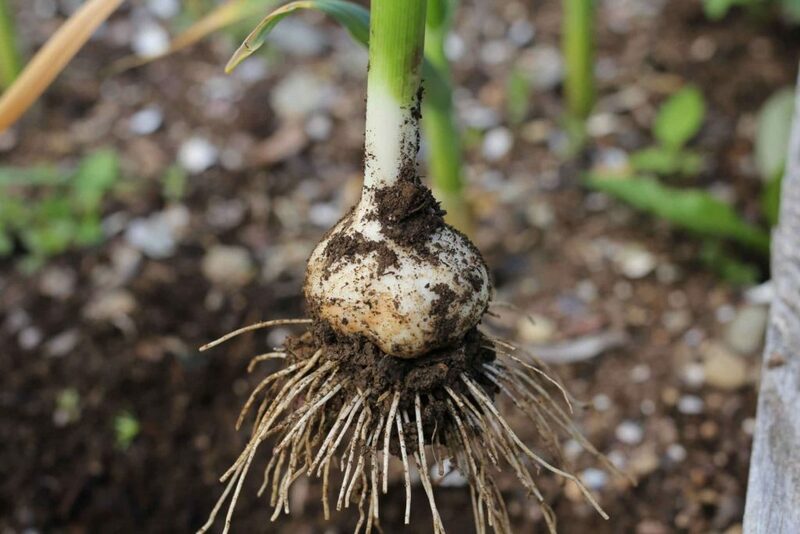 Removal of the scape motivates the garlic plant to put energy into growing the bulb instead of the flower, thus improving the size of your harvested bulbs. You can easily identify the scape, it will be a centre stem with a pointed tip and will develop a curl. Garlic is generally ready to harvest in August. When half the leaves of the garlic plant have turned brown, this is a good indication that it is time to harvest. Avoid watering the garlic or wait until the ground has dried for a few days if it’s been rainy. The garlic will come out of the ground easier and cleaner this way. 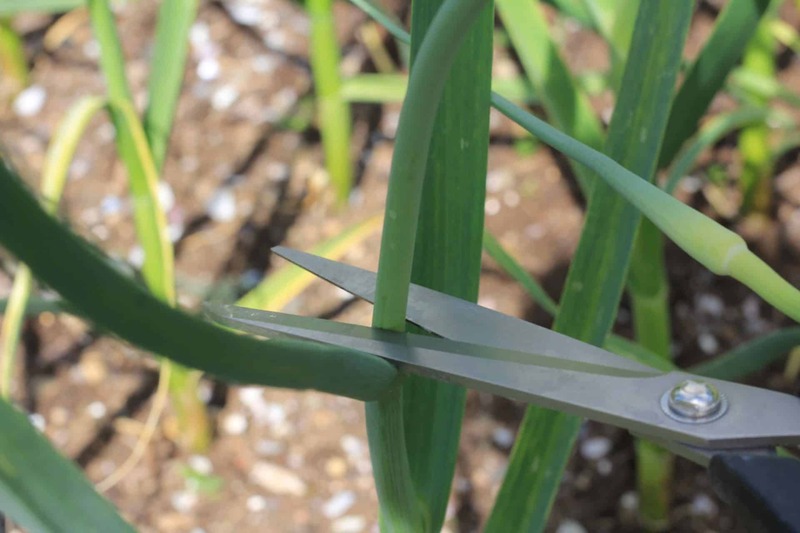 To harvest the garlic, pull on the stalk gently to pull the bulb from the ground. Most often they will pull out of the ground very easily. If you have any trouble simply loosen the soil around the bulb first. To improve the shelf life of garlic, it must be cured. 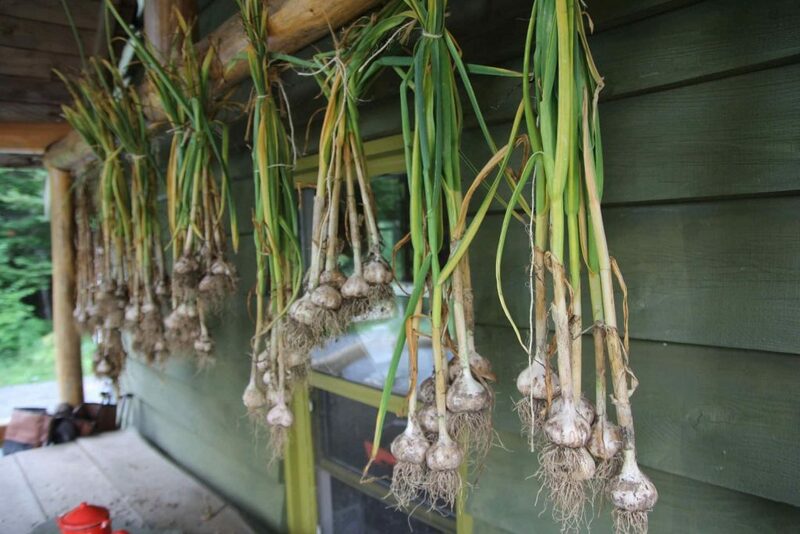 Gently brush the dirt off of the bulbs and tie the garlic into bunches of 6. Hang the bunches by the stalks in a dry, well ventilated area for several weeks. The more air circulation the better. It takes about two weeks for garlic to cure completely. The wrappers will dry and the stalks will have started to dry out and turn brown. Once they have cured you can trim the stalks and gently brush off any remaining dirt from the bulbs. 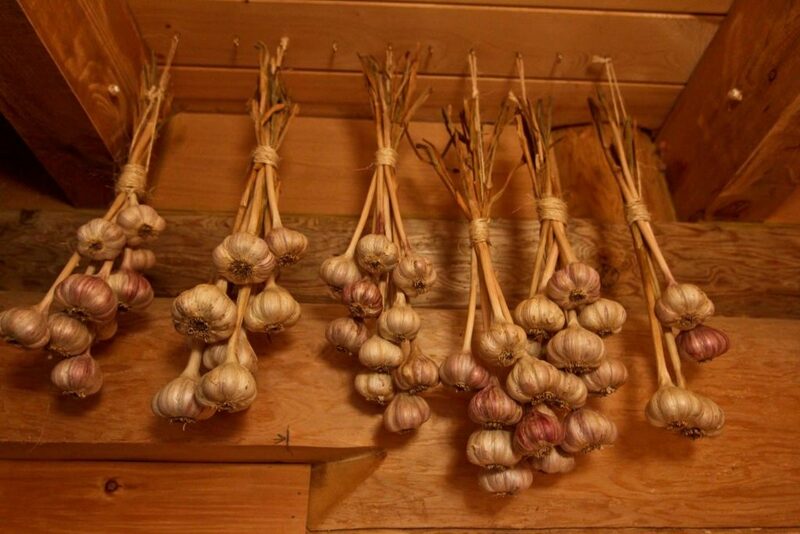 Depending on the variety, garlic will store quite well for six months to a year. Keep it in in a dry dark location. You can snip off the stalks completely or you can create nice rustic garlic bundles using twine. Thank you so much Charlotte Walker for this wonderful information!!! One of my best friends sent me 2 different varieties of garlic to plant. I absolutely love garlic!!!!!!!! The flavor & smell amaze me!! Anyway…..I planted them. She sent me the purple garlic & another kind. Well my purple garlic was doing good but the other one was like a dud, it never grew at all. 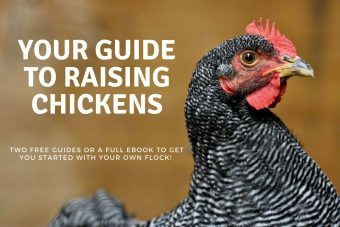 I had looked up how to harvest & plant garlic before I planted them. Well the info I read here on Pinterest was seriously lacking valuable information. Information like separating the bulbs, using mulch & so on. Well needless to say I went to harvest my purple garlic & there was nothing there at all but a root system. I did put the plant back in the soil. I planted my garlic in a pot which I think was my first mistake. Then I planted them way too late. Now that I found this pin I know exactly what to do next time. Even though my plant has a root system does that mean it’ll die & not continue to grow? Oh I have so many question LOL! Here is my email in hope that you have a few free minutes to message me back…[email protected]. I also noticed there were little gnats in my plant so what can I use (if anything) to mix in the soil to keep the bugs out? Tracy, I tried emailing you but It bounces back. Sorry I was unable to give you a hand with this. Feel free to send us a message if you are still looking for answers!